Tom Beauregard is global health management practice leader at Hewitt Associates, a $2 billion global human resources outsourcing and consulting firm in Norwalk, Conn.
Brian Ferguson is chairman and CEO of Eastman Chemical Co., a $5.8 billion manufacturer and marketer of plastics, chemicals and fibers in Kingsport, Tenn.
Robert J. Greczyn Jr. is president and CEO of Blue Cross Blue Shield of North Carolina, a $3.2 billion heath care provider in Chapel Hill, N.C.
Vicky B. Gregg is president and CEO of Blue Cross Blue Shield of Tennessee, a not-for-profit health benefits company in Chattanooga, Tenn.
Raymond F. McCaskey is president and CEO of Health Care Service Corp., a Chicago-based mutual company made up of Blue Cross Blue Shield of Illinois, Blue Cross Blue Shield of Texas and Blue Cross and Blue Shield of New Mexico. Thomas O’Reilly is director of group benefits at Illinois Tool Works, a $10 billion multinational manufacturer of highly engineered fasteners, components, assemblies and systems, based in Glenview, Ill.
Edward Rabin is president of Hyatt Hotels Corp., a Chicago-based upscale hotel and resort chain with 123 Hyatt Hotels & Resorts in the United States, Canada and the Caribbean. Blue Cross Blue Shield companies with combined revenue of nearly $183 billion. Diane C. Swonk is chief economist and senior vice president of Bank One, a $16.2 billion financial services company based in Chicago. Mention “heath care” to the CEO of any large company and the prevailing reaction is an outpouring of frustration. And for good reason. Continuing a trend of double-digit increases, health insurance premiums rose an average of 14 percent last year and are expected to jump by 11 to 20 percent annually for the next three years. Small wonder that there are a rising number of Americans-some 43 million at present-without any insurance whatsoever. What’s more, as 77 million baby boomers head into retirement, increasing longevity and corporate cutbacks on retirement health care benefits are taxing an already shaky Medicare system. For myriad reasons, the burden of shouldering this spiraling health care cost disproportionately falls on large U.S. corporations. With small businesses increasingly unable or unwilling to offer affordable health insurance, employees of large corporations frequently bring entire families into their firms’ insurance fold. Worse yet, thanks to price controls and restrictive national health programs in overseas markets, U.S. health care consumers pay the highest prices for drug therapies and medical diagnostic and treatment technologies, effectively subsidizing both health care R&D and treatment in industrialized nations as well as developing countries. Efforts to manage these costs are fraught with problems. At best, attempts to cut health care benefits or raise employee contributions provoke outrage among employees or diminished morale; at worst, in the case of a unionized employee base, the cuts spur outright revolt. At the same time, pressure for private-sector solutions to the looming health care crisis continues to build, thanks to the real and growing fear that Congress will step up to the plate with a health reform bill. The bottom line? From manufacturing industries to the service sector, CEOs are suddenly finding themselves in the health insurance business, desperately seeking solutions and strategies that will enable them to provide quality care at an affordable price. And who can blame them? Spurred by ad campaigns for prescription drugs, Americans have become avid consumers of brand-name prescription medications for everything from allergies to heartburn. The resulting spike in what some view as unnecessary doctor visits and medications, experts say, has contributed to health care cost hikes. At the same time, important medical advancements also spur cost increases. And, in most cases, treatment with these expensive innovations-even pricey ones with uncertain outcomes-is warranted. After all, when facing a serious condition, a costly treatment therapy with a small chance of success is vastly preferable to having no chance of recovery at all. A growing number of companies are attempting to address the issue through new variants of health care programs and plan offerings. Recognizing the 80/20 principle-that 80 percent of health care usage comes from 20 percent of the employee base-more companies are adopting wellness programs that educate workers about the benefits of healthier lifestyles and provide incentives for behavior modifications proven to prevent health issues or slow the progression of existing diseases. Often, such programs include educating employees on proactive management of chronic conditions such as diabetes, arthritis, asthma and heart disease and offering financial incentives for following the care protocol. These can range from waiving co-payments for necessary medical monitoring visits to a reduction in health care contribution costs if recommendations on smoking cessation or weight reduction goals are met. Revamping benefit plans to address cost issues is another emerging approach to deal with rising health care costs. Some firms adopt tiered plans, where employees choose from an assortment of plans at different contribution cost levels to the employee, who pays more for greater flexibility and lower co-pays and deductibles. Others make the jump to consumer-driven health care plans, which combine a high-deductible health insurance policy with a tax-advantaged, employee-managed medical savings account that covers some or all of the deductible. Money left in the account at the end of the year generally rolls over to the next year, providing an incentive for prudent spending. Rather than simple attempts to defray increases through cost shifts and incentive programs, a more wholesale approach is required, argued Beauregard and other roundtable participants, who noted that there is plenty of room for improvement. Health care accounts for 15 percent of the national GDP, or $1.7 trillion, yet broad performance metrics are virtually nonexistent, fraud and abuse taps in at between $50 billion and $75 billion a year, and the little quality outcome information that exists is not available to the majority of consumers. “If you think about it as the equivalent of a manufacturer not having the systems and information flow to understand and measure quality, that’s pretty scary,” said Blue Cross Blue Shield of Tennessee’s Gregg, who pointed out that predominantly paper-based medical records impede the information-sharing essential to the development of best practices in medicine. “You would think it would be fairly simple to say that for a given condition this treatment has the best outcome. But if you take a simple example-a urinary tract infection without any complications-there are 135 different ways that physicians treat that same urinary tract infection. Which is the best? Which is the most cost efficient? And why don’t all physicians use whatever that is?” To bridge the information gap, Gregg urged a shift to electronic record keeping, which would facilitate the kind of data crunching essential to quantifying results. Health care, however, is currently plagued by a dearth of information and asymmetric information-a disconnect where employers understand costs and may even have access to data on results, but employees don’t. Happily, progress on that front is under way, according to Scott Serota, CEO of Blue Cross Blue Shield Association. “We have made great strides in defining quality, and we’re reaching consensus with some of the specialty groups as to what defines quality service,” he said. Already, progress on that front is under way. Thanks to the drastic rise in health care costs, recent years have seen employers and, to some degree, consumers gain a greater awareness of the inefficiencies, information gaps and cost-versus-quality issues plaguing health care. At the same time, overcoming the inertia inherent to an admittedly inefficient but deeply entrenched system is no small challenge. Ultimately, it’s the threat of government intervention that may well provide the sense of urgency necessary to overcome initial resistance and speed reform, noted Swonk, who added that while the status quo is unsustainable, changing the system will be a long and arduous process. The conviction that government solutions, such as mandates, simply wouldn’t work was universal. Participants argued that the health care system is so complex with so many different players-companies, insurers, medical device makers, pharmaceutical companies, hospitals, doctors and others-that it will defy a public policy solution. 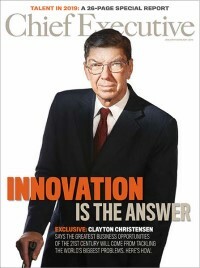 The burning imperative, they agreed, is for CEOs to work to discover new solutions. At Hyatt Hotels, double-digit cost hikes for three years running prompted a health care revamp. “After bearing increases of 12, 16 and 17 percent, we finally concluded that the rising costs are not just going to go away,” says Ed Rabin, president of the Chicago-based hotel company. To address the issue, Hyatt has launched health programs to educate employees on wellness and is exploring ways to administer claims more efficiently. “In health care, as in any other business, better management and supervision can help drive down costs without losing any of the care being provided,” says Rabin, who notes that compensation and benefits represent the hotel industry’s single biggest cost component. Further complicating the issue is the fact that while all employees receive health care benefits, many workers value cash far more than the costly benefit component of their compensation. Since Hyatt extends benefits to every worker on its staff, the company is exploring new health care offerings geared toward employees lower on the pay scale who may place less value on health care benefits. Can the Train Wreck Be Avoided? Eastman Chemical CEO sees much handwringing, but few pilot programs. What effect do health care costs have on companies competing globally? Domestic health care costs in the U.S. are roughly 15 percent of GDP, compared with 8 and 10 percent in the developed regions, such as Japan, Europe and Canada. The double-digit pace of growth is also an issue. Aside from energy recently, health care is the most consistent high grower in my cost base. So it is a large factor in the competitiveness of domestic manufacturers. What role do you feel the government can or should play in this issue? Are we on a road toward socialized medicine? It would be a lot easier to improve the health care system we have than to start over. In our system there is a significant insulation of the consumer from the provider that creates a strange dynamic where the normal relationship between supply and demand is reversed. In the worlds I live in competitively, the more supply, the lower the pricing; in the medical community, pricing just keeps on going to pay for the additional supply. My bias would be toward trying to do a better job connecting the consumers with the providers so that they are more sensitive to what is going on and make better choices. Will consumer-driven health care help with that? The phrase “consumer-driven health care” sounds good until you peel back the onion and find out what it really means. There are a variety of mechanisms around trying to increase people’s sensitivity to the choices they make and what it costs, and have some personal affect on that. In some cases, it can be something as simple as the healthier your lifestyle, the lower your premiums. Could incentive programs that reward employees for adopting a healthier lifestyle put companies at risk for discrimination suits? That is the strangeness of our tort system. Some of the 20-plus percent of extra cost incurred in this country is based on our legal system. [Wellness initiatives] are an example of programs where there are no losers, and yet the legal system could get in the way. What are you doing to connect employees more with the costs? We have a variety of initiatives encouraging people on healthier lifestyles, but so far no financial incentives. We have been working very hard on the way we buy our health care and on making employees aware of the way that we buy it. In 2003, for example, we set up a pharmacy on company property here in Kingsport, Tenn., where we have 8,000 employees. We tell our employees, “Here is your cost structure at the Eastman pharmacy. You are free to go elsewhere, but the cost to you will reflect that.” We are essentially taking away the margin that would have gone to the local pharmacist, which doesn’t make us popular in the community. But it allows us to buy smarter and it puts control in the hands of the employees. What needs to happen to better educate employees? Information is one of the keys. When consumers shop for cars they go to Consumer Reports or check the Kelly Blue Book. People have become educated over time about how to buy cars, houses, washing machines. But the data systems used by doctors are arcane and fragmented, which doesn’t allow for pooling and understanding of data efficiently. How many different ways do you treat acid reflux disease, and what is the best most efficient way to treat it? That information is not readily available to consumers. Under the status quo, big companies like mine will see rates go up the fastest. That’s when the train wreck happens. At some point companies start adding up all of these costs-more than 20 percent in North America- and shutting down or moving. Then you see the indignant response of lawmakers. I don’t see a lot of pilot programs that are trying to find a private health care delivery answer. I see a lot of handwringing, but no public-private partnerships working to try some of these answers out and see if we have a private solution that works. In the absence of those, we wait for the train wreck to happen and for government to get handed the problem. Addressing costs is only half the solution. Often, companies facing skyrocketing health care costs address the issue through measures that nibble away at benefits, transfer some costs to employees or attempt to give employees greater personal exposure to the costs associated with their health care choices. But cost-focused measures like these address only half the problem, point out experts in the field.